Schaffner Press, Inc., 9781943156085, 320pp. In 1974, at the age of seventeen, author Glenn Berger served as “Schlepper” and apprentice to the legendary recording engineer Phil Ramone at New York City’s A&R Studios, and was witness to music history on an almost daily and nightly basis as pop and rock icons such as Paul Simon, Bob Dylan, Mick Jagger, Frank Sinatra, Burt Bacharach, Bette Midler, and James Brown performed their hit-making magic, honed their sound, strutted their stuff, bared their souls, and threw epic tantrums. 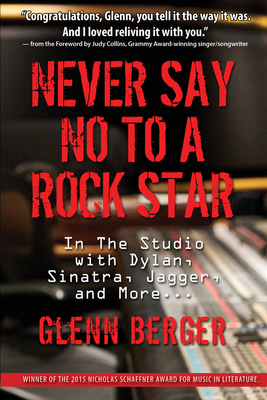 In this memoir, full of revelatory and previously unknown anecdotal observations of these musical giants, Glenn recounts how he quickly learned the ropes to move up from schlepperhood to assistant to the tyrannical Ramone, and eventually, to become a recording engineer superstar himself. Not only is Never Say No to A Rock Star a fascinating, hilarious and poignant behind-the-scenes look of this musical Mecca, but Berger, now a prominent psychologist, looking back through the prism of his youthful experience and his years working as a counselor and therapist, provides a telling and honest examination of the nature of fame and success and the corollaries between creativity, madness and self-destruction. Glenn Berger, PhD was for many years in the 1970s and 80s a recording assistant and later engineer/producer for the recording studio A&R Studios. After 20 years in the music business, Glenn became a psychotherapist. Excerpts from his memoir have been published in Esquire, Rolling Stone, and SOS Magazine. He lives in New York City.